Last night – exactly the second night of the NAMM show, was spent packing my bags and planning my outfits. Inevitably I will forget the correct shoes or some required piece of wardrobe trickery, thus quality planning time is essential. The NAMM show is, well let’s start with the acronym – The National Association of Music Merchants… but they don’t actually use that any more as it’s a bit broader these days. My definition is a great weekend to hang out with my music oriented friends – especially my best friend Kat. 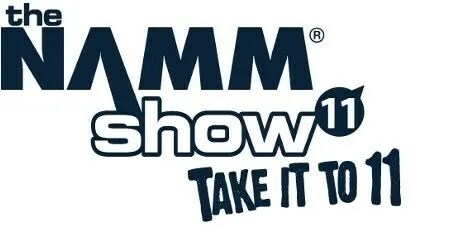 Maybe see some cool stuff and grab some guitar picks for Thing 1 and Thing 2 who must eat them as the supply I gained last year from NAMM 2010 has dwindled down to 10. Dr. Malibu encouraged me to wear clothes this year. (I assure you all parts of my body were fully clothed last year). This morning is a dull wait. Bags are packed. Hotel is confirmed. NAMM badges printed. Schedule of booths and events reviewed. Camera is charging. I’m ready. Ginger was my parents dog. And she went missing right before Christmas. It’s always heartbreaking when you lose a pet – and it was no different for my parents. They moved to Hesperia about 10 years ago – it was the closest place they could afford near where I live in Los Angeles. The property they found is special – it’s an oasis in the desert – high desert as it is. The property used to be a Christmas Tree Farm and the 3 acres is filled with gorgeous tree’s grown well past the point of a standard Christmas tree size. The previous owners had owned an antique store and the property was decorated in an old West motif – complete with a water tower, wind mill, wagon and yes, even a faux out house. They also have a wonderful fish or Koi pond which my parents actually moved to their back porch – the better to enjoy the zen of it all. And so it was, when they first settled this property it was time to get a dog. We’ve always had dogs growing up and when it comes to animals, those of you who know my father might be surprised to find out he’s a soft touch with it comes to furry living things. (that’s how I became a horse owner at 12 but that’s another story). They went to the local shelter and found Ginger, cowering in the back. 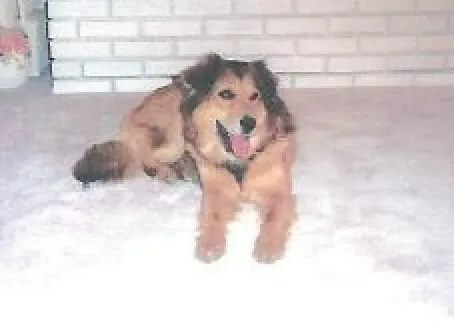 Ginger was a fluffy, medium sized, pretty little dog that was in dire need for a better life. They named her Ginger for her reddish brown coat, and brought her home and immediately let her loose out on their three acres – only to have her take off and disappear. It was obvious that Ginger hadn’t experienced the kinder hand of man kind. Eventually, Ginger came home and slowly, my dad and mom nutured that dog to a very fine pet. For the first few years they had her, Ginger would not go near a stranger, especially if it were a man. But over time, through love and a good life, Ginger became a friendly, happy, social pet. My dad would take her out several times a day into what we jokingly call “the back 40”. There, Ginger would hunt and chase rabbits to her hearts content (Dad would never let her harm one though). I would bring my dog, JD out there when I visited and JD quickly learned the routine of nudging my dad out of his armchair and encouraging him to take him for a leashless walk in the back 40. Ginger was a good dog. She minded. She stayed on the property, even with the gate wide open. She listened and hung onto every word my Dad would say. I don’t recall ever hearing her bark. She was never a pest, and would only sweetly nudge your hand to rub her belly. Being so far from me and the grand kids is hard for my parents. They didn’t know a lot of people there in Hesperia and Ginger provided them with a lot of companionship. She was there for my mom when my father was hospitalized for heart surgery. She’s been there for my dad during my mom’s struggle with her health. And one morning – Ginger was gone. A little while earlier, when my dad went out to fetch the paper, she’d been sitting on the porch. After my dad read the paper, he came out to get her for one of their many daily jaunts, but Ginger didn’t come when called. They couldn’t figure out what happened. They looked everywhere. They assumed she’d been stolen. My mom even thought she’d heard voices talking by the front gate while she was in her bedroom. Could someone have coaxed her out of their property? They handed out flyers to the local schools, pet stores and shelters. I posted ads on the internet. We were all sick with the possibility that someone had stolen her – hopefully because she was such a pretty dog, and not for use as a bait dog in dog fighting. My Dad couldn’t sleep at night from the anxiety of not knowing. Dad called me a few days before I was coming up there to visit. And he asked me to not let my dog, JD, out of the car until he got there. He wanted to follow JD in the chance that JD would lead him to where Ginger might be laying. I questioned my father on this. Surely Dad, you don’t think that he’ll find her? I thought you said she was stolen? But Dad explained that if there was a chance that Ginger was out there, he’d be able to feel better knowing that he could bury her and put her to rest. The conversation disturbed me. It was heartbreaking to see my parents suffering like this. I too was angry at the idea of anyone who had stolen her but this scenario my dad proposed didn’t seem likely. It concerned me for my Dad who is getting up there in his years. But I did what he asked. When we arrived, we kept JD leashed until my Dad came out. Dad had left the gate open and was right there when we arrived. We let JD go and JD did his JD doggy thing. Running here and there, peeing on a tree or bush and sniffing the ground. My dad called hin over to a line of bushes near the front gate. “This is the only place I haven’t been able to get in to look” he said, and he pointed out how thick the bushes were. It would be impossible to see in there. JD wanted nothing to do with those bushes. So we all just followed him out to the back 40, as was our habit from the times we visit. Again JD ran all over, sniffing here, peeing there. At one particular tree – a tree that I have no words to explain why, but the tree just has always seemed like the center for the back 40, JD stopped, spooked! He barked 3 times and his fur stood up on end. Just then a rabbit darted out from under that tree, and JD gave chase. I thought his reaction was a bit odd, surely he wasn’t spooked by that rabbit? Walking over, I looked under that tree, and there was Ginger. Lying on her side, her pretty red fur still intact, JD had found her. I called my Dad over. My son and I helped him dig a hole in the garden. I helped my dad carry her to the spot we would bury her. I was very relieved to find her. To know that it was just her time to go, that she had done what animals do when it’s their time to die. I was relieved no one had abused her and was causing her stress. If she had been sick, she hadn’t let my parents know – surely the vet bills would have been more than they could have afforded. After we were done, we all came inside. We were all very sad and we told my mom the news. She took it quite well. JD followed us but it was clear, he too was unsettled. He paced the carpet and wimpered at my dad. JD is not a wimpering kind of dog. He’s the silent strong type. But I realize that he too was missing Ginger.